At the start of November, we are launching something brand new from Claire North – author of the critically acclaimed and bestselling novels The First Fifteen Lives of Harry August and Touch. Enter the world of the Gameshouse, a world where the best players compete secretly not just for riches – but for political power, for the control of kingdoms, for their very lives… These are the tales of The Serpent (UK|US|ANZ), The Thief (UK|US|ANZ) and The Master (UK|US|ANZ). 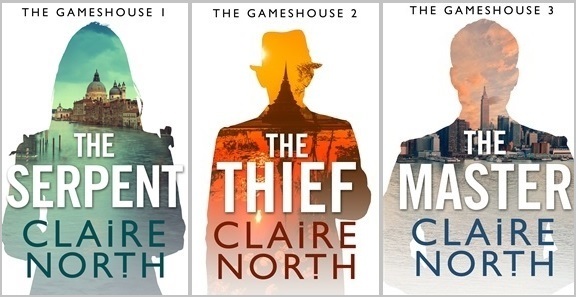 The Gameshouse novellas are three digital stories that can be read separately, but which also fit together to make a complete, intricately woven tale. These stories are thrilling, so rich and beautifully crafted. They’re a perfect example of how Claire’s stories are breathtaking in scope but also painfully intimate. If you’re a fan of her previous novels then we know you’ll love these stories – and they’re also a great way to sample her writing for the first time. There, fortunes are made and broken over games of chess, backgammon and every other game under the sun. All three titles will be released digitally at the start of November 2015, and are available for pre-order now. They will also be available as a complete volume in audiobook.